Be SURE to follow the ABC Wakefield link above, and then to follow the blog link posted Dec. 20, 2007. Wonderful (if that’s the word) shots of this place as it is today. After the last show, the doors were locked and this theatre was left almost as it was. Now, urban archaeologists are entering and exploring it. I’m not sure they are actually theater buffs; there are no shots inside the projection booth, for example, and no general shots of the lobbies and restrooms. But even so, these are great and sad shots of a sweet old place left to rot. Yes, I also would have liked to see pictures of the inside of the projection booth (box), lobby, and restrooms. That flood must have been because there was no electricity to run the sump pumps. What a sad set of photos, I particularly liked the art deco seat ends. W R Glen was the house architect for the ABC chain, designing many cinemas, now mostly demolished as the survival rate of his buildings is fairly low. These include the Adelphi Cinema in Dublin, where part of the facade remains as an entry to a multi-story car park. You can see a photograph of it on the Art Deco Ireland website. Sorry, I should have given the web adress for Art Deco Ireland. Absolutely amazing shots. I photographed a local theater in my neighborhood while it was being demolished a few years back in the dead of Winter. I totally understand the dangers and the risks you took, especially in the dark. Bravo to a job well done!!! I’m glad my pictures have recieved some very positive feedback, thanks! @ Ken.. I’ve added a photograph of the projection room onto the article now. @ Monical… I left a number of shots off due to them been poor quality camera flash shots, the place was pretty dangerous to navigate in the dark, Taking quality pictures wasn’t too easy. 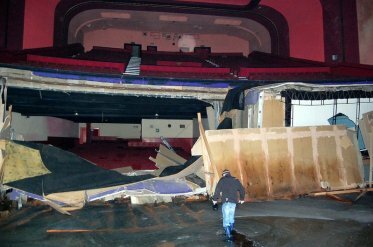 Were not theatre buffs so sadly our knowledge wasn’t as good as it could have been, but we are amateur photographers who like to try capture some of our lost building heritage, and also places were no cameras have been before. Abandoned Asylums, Railway tunnels, transport, Derelict buildings in an interesting, informative way. There some more of my stuff here if anyone wants a further look. Cheers! Abandoned asylums sometimes have theaters. Let me add my thanks for the additional shots. I’ve never done what you do. I can only imagine the difficulties, particularly those of lighting. You have my admiration and great thanks.